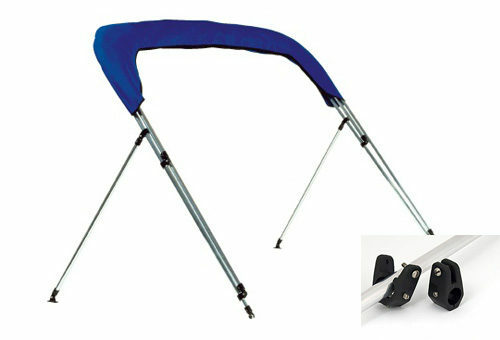 Specially designed to hold your top up and out of the way when top is folded and not in use. Each round-tube brace kit contains 2 braces which can be cut down to the desired length, 2 deck hinges, 2 hinged jaw slides that make installation easy by eliminating the need to disassemble the main bow, and two pole clips to secure the braces to the bimini top frame and eliminate rattling while the top is folded down for travel or storage. Square tube brace kits contain 2 braces and 2 deck hinges with quick release pins which allow the square top to easily fold down into the storage position. All screws necessary for mounting are included. 1 pair per package.